It has been nearly 25 years since the hit TV sitcom starred in living rooms across the nation, but we may be just reaching the golden age of the Golden Girls. More the merrier with senior home sharing! While their arrangement may have seemed unusual at the time, four adult women sharing an apartment may not be that far fetched. In fact, many people, widows and widowers in particular, who are approaching retirement age or who have retired already are seeking the benefits of home-sharing for their later years. The trend is becoming increasingly popular, especially among women, recent national news outlets have reported, citing data from UCLA indicating one in three baby boomers are unmarried. It makes sense: studies show loneliness can be a major detriment to health and well being, and many people are not able to physically maintain their homes on their own when they are older, thus they face steep costs for household tasks such as cleaning, exterior maintenance and transportation (if needed). Why not share the costs and benefit from all else that a live-in roommate has to offer? But it’s not all Golden Girls when it comes to homesharing. There are several different arrangements for which the terminology is being used in the U.S. today. How does it work? Most like the Golden Girls-style housing, under this arrangement, two or more retirees move into a single house or apartment in order to share the household costs and enjoy the company of one another. When does it work best? This arrangement works when one party owns an existing home, and another happily pays rent in addition to agreed-upon household terms. Or, both parties rent. In one recent instance cited by NPR, a Florida woman had a five-bedroom house that was too big for her needs. She was able to cohabitate with several other single women facing similar circumstances. How to find a match: Some states, and many jurisdictions have homesharing programs that will help interested parties draw up contracts, pair with prospective matches, and navigate the home sharing process. The National Shared Housing Resource Center offers more information. How does it work? In this type of arrangement, an older homeowner rents space to a younger person who can provide help with household chores, maintenance, transportation and more. In some cases, the space is not rented, but bartered in exchange for the housework and other services the younger tenant provides. When does it work best? Multi-generational homesharing is most obviously found in family situations. Outside of families, there are some organizations affiliated with colleges and universities that match students with older homeowners in the area. How to find a match: Inquire with local home sharing organizations, or universities in your area. University of Michigan, for example, operates a HomeShare program through the Michigan Health System’s Housing Bureau for Seniors. 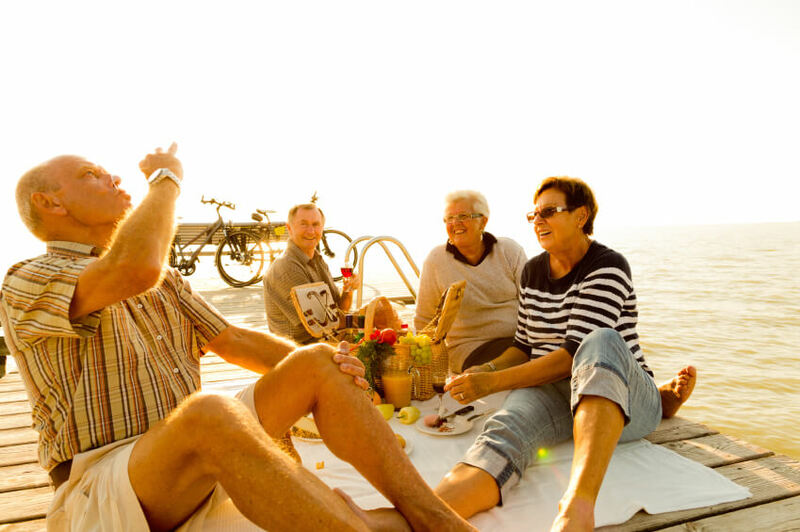 It pairs 55+ individuals with matches of all ages. Co-housing is a little different, in that it often applies to a planned community where people live separately, but share resources such as transportation, social gatherings, outdoor amenities, and a common spaces. The Villages model is perhaps the most well known form of co-housing for seniors, with Villages neighborhoods operating in various states and cities nationwide. How does it work? This type of “shared” community housing is the most independent, and it does not offer the same cost cutting benefits that the other types do. Retirees, single or not, live in proximity to one another under this model, as they would in any other neighborhood. This one just happens to cater more to their needs. How to find a match: The Cohousing Association of the United States offers a directory of resources for those seeking cohousing opportunities. Homesharing is a solution, but it’s not for everyone. Like all living arrangements, it comes with pros and cons. A homesharing agreement should include a contract to ensure all parties are protected and are in agreement. There are risks inherent in renting or sharing a space with anyone, at any time. If you’ve lived alone for many years, suddenly living with a roommate is an adjustment that may take time to get used to. Those who cohabitate, but who hold different hours may not be the best fit, for example. If you’re interested in a homesharing solution and would like to know more about the financial implications including costs and benefits, talk with an experienced financial professional for more information. Or, use the NewRetirement Retirement Calculator to help you assess whether home sharing is a good financial option for you. The system will help you assess your current situation and give you the tools to discover if cutting costs with house sharing and other options will give you a more viable financial future.